Kuta Langis Ecolodge has unique accommodation in a beautiful setting and THE most amazing view and is a great place to chill out and relax....rewild yourself. Welcome to KUTA LANGIS Ecolodge and our “Jungle Villa”. Only 30 minutes from Bukit Lawang with stunning views of Gunung Leuser National Park. If you really want to get away from everything and reconnect with nature then a stay in our “jungle villa” at Kuta Langis Ecolodge (KLE) is the perfect place for you. 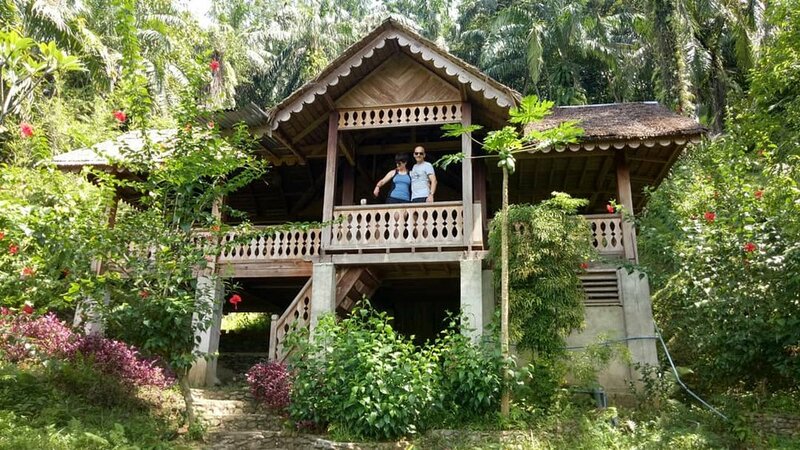 It is only 30 minutes from the hustle of Bukit Lawang, situated in a converted palm oil plantation right on the borders of the national park but you will feel like you are in a different world…your own private rainforest resort. We have no neighbours. The jungle villa is built from locally and sustainably sourced hardwood and has two double rooms, a camping camping platform in the eaves of the palm thatch roof and it can sleep up to 6..and possibly more. But it is the incredible views of the rainforest from the open plan terrace that will really blow you away and hopefully make you never want to leave. There are two bathrooms and an open air shower coming soon. PACKAGES to stay at the villa start at 1,200,000 idr per night. This includes: exclusive use of the villa, all food and drink, return transport (motorbike) from Bukit Lawang and one river walk to the amazing wild swimming spot. For more than 2 people there will be small supplements to cover the extra food and transport. Jeep transfer is also available for 350,000 idr. You can of course use KutaLangis as a base from which to go trekking and explore virtually untouched rainforest! Anything is possible from a few hours river walk, a day scrambling through canyons and swimming in waterfalls to multi day treks with camping in the jungle. There is plenty of wildlife to see but as it is truly wild and not used to human visitors it generally tends to hide away from humans. Only Green Hill take guests trekking in this area and have many many years experience here so you are not likely to meet any other trekkers. You could even stay here and go trekking to Bukit Lawang for the day. Have a look at the info and prices on our trekking page and then email/whatsapp for further info. 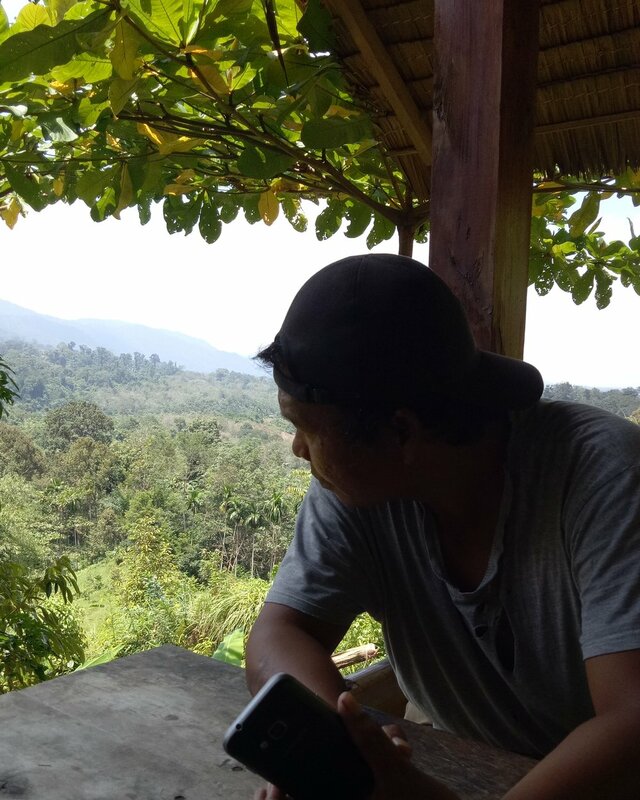 There are two villages close to Kuta Langis Ecolodge, Tualang Gepang and Bukit Kencur, they are surrounded by palm oil plantations and the main income is from rubber tapping and subsistence farming. You can take a guided walk around and learn about daily village life (a great option for kids to learn about a different way of life). You can also take a wander around on your own and perhaps sit in the little warungs (cafe) and buy some snacks or have a coffee or some noodles and maybe even join in the later afternoon badminton and Takrow (best described as foot volleyball played using a ball made from rattan). We have an active community conservation project which you can join in and you can help make a difference.